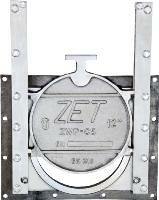 Description: ZCP-S series is a rectangular gate with 3 sides sealing. The gate can hold water head up to it's height and above it the fluid flows over the door. Stainless steel frame to be fixed to the channel/wall/side walls. The frame is flush invert. The frame should be in suitable height to assure full opening. Stainless steel gate with reinforcing ribs. Attached to the gate are bronze slides and neoprene seals for bi directional seal. Stainless steel rising stem as standard. Non rising stem also available on demand. Maintenance free manual actuator, bevel gear or electric actuator. Description: Zwp-cs penstock is a Circular opening penstock. Its rigid C8FM (ss316 casting) structure guarantee drop tight sealing for up to 20 meters on seating and off seating water head. C8FM (stainless steel) casted body to be fixed to the walls the body and the seat are one part. To the body attached specially designed guides that prevent any contact between the seal and the seat until the last few millimeters of closure and then tighten the gate to the seat. C8fm (stainless steel) gate with specially designed vulcanized neoprene seal. The gate and the seal's design prevents any damage to the seal in case of closure against solids. Stainless steel rising stem (other actuation options on demand) and when needed HDPE and stainless steel supports. Stainless steel floor pillar (other actuation options on demand) with maintenance free manual actuator. Bevel gear or electric actuators as an option. Description: Zwp-ss penstock is a rectangular opening penstock. Its rigid stainless steel structure guarantee drop tight sealing for up to 20 meters on seating and off seating water head. Stainless steel body to be fixed to the walls the body and the seat are one part. Stainless steel gate with specially designed hydrodynamic double neoprene seal. The gate and the seal's design prevents any damage to the seal in case of closure against solids. 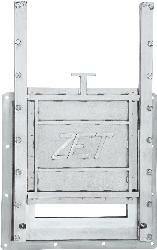 Description: ZTM-A telescopic bellmouth is used to control water levels in reservoirs by determine the overflow level . Two stainless steel tubes ,one is fixed and the other one can be moved to change the overall length. The adjustable tube can not mistakenly be pulled out. Between the tubes there is a dynamic multilayer seal and bronze guides.